That bread looks great Suganya...and congrats on winning the readers choice!..that was indeed a great shot! That's a lovely slice...the texture looks great. coffee pic looks soooo good. have been meaning to try out some ideas with coffee for a while. will get around doing that in december! Wow looks delicious! Are u going nuts with friendship starter or what ! :-) Love u're enthusiasm! OH also, Congrats on the award Dear! You deserve it! Your photography skills are simply superb! A notch above. Keep it going! 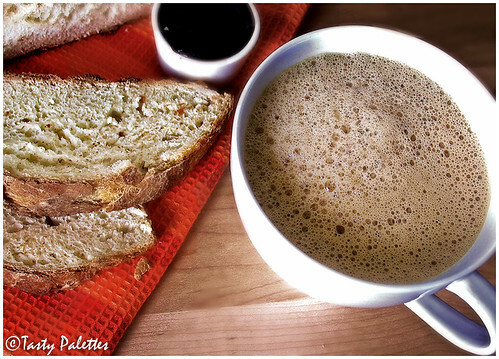 Home baked bread with Indian style coffee must have been really divine b'fast! Congrats on your award at Click! You totally deserved the award, it was a captivating picture :). Congrats!! !For your well deserved victory!!! :D..I expected readers choice award for you! !And was right! !..Congrats again!! Bread looks delicious!!! And congratulations for your award!!!! Suganya congrats... Bread and coffee looks so good. Congrats Suganya! can you make me some coffee like that! simply superb! By The Way, congrats on the Click read choice award!!! It was a well deserved one!! Congrats on yr well deserved award. You make everything look great! Congratulations on the award. Bread with that cup of coffee looks so delicious. Also, congrats on winning the reader's choice in the 'click' event. I knew you would get it. Congrats on your award suganya! Well deserved indeed... And the bread looks great! The bread and coffee look lovely. I agree on the versatility of the Amish Friendship bread... it lends such a nice texture and taste to everything. Loved your picture in 'Click'!! Congratulations!!! Well done! Kapi looks good. Congrats, Suganya! That egg shot is very clever, whimsical and deserving. First of all,congratulations on the win. My husband actually thought that was the best shot among them all....very natural and intriguing. You are doing very well in the baking department! Great to see 3 variations of Amish!!Brilliant!! Congrats for the award. I was expecting you to win, even before you participated. I loved all your three recipes using the amish friendship loaf. Especially that mouth watering naan. gosh... this is to die for breakfast.... i can imagine the aroma coming from the bread!! A quick question, where did you find whole wheat bread flour. I am trying to find it in stores for months now, but in vain. I am able to find them online, but the shipping charges are astronomical.. I am living near philly, east coast. Please let me know if you found it in any store..
K, Its been long since I stocked whole wheat bread flour in my pantry. I don't remember where I bought it. But these days I buy gluten (Bob's Red Mill brand)separately and mix with whole wheat flour to make bread flour. The gluten stays forever in the freezer, and I don't have to stock zillion types of flour. Hope that helps.